BRAUN - Buda Citerioris Hungariae Caput Regni avita sedes, vulgo Ofen. BRAUN,G. / HOGENBERG, F. - Buda Citerioris Hungariae Caput Regni avita sedes, vulgo Ofen. Buda Citerioris Hungariae Caput Regni avita sedes, vulgo Ofen. - BRAUN,G. / HOGENBERG, F.
Title : Buda Citerioris Hungariae Caput Regni avita sedes, vulgo Ofen..
Map maker : BRAUN,G. / HOGENBERG, F.. Date : Amsterdam, ca. 1694. Size : 12.4 x 18.8 inches. / 31.6 x 47.7 cm. Description :Shows the Hungarian capital of Budapest. Originally engraved for the Civitates. Compiled and written by George Braun, Canon of Cologne Cathedral. The drawings was made by Joris Hoefnagel in 1617. The verso is blank and this print originates from Frederick de Wit town book of European and Asian cities (Theatrum Praecipuarum Totius Europae?) published after 1694. Buda is seen across the Danube with its huge hilltop fortress and royal palace. On the opposite river bank is the strong fortification of Pest, with a unique pontoon bridge linking the cities. The engraving depicts the two towns during a period of Turkish occupation, when Buda was the seat of the local Ottoman pasha. During that period many of the churches were converted to mosques, shown here with their characteristic domes. The illustration in the foreground shows the pasha with his delije (body guard) who wears feathers pierced through the skin of his scalp. 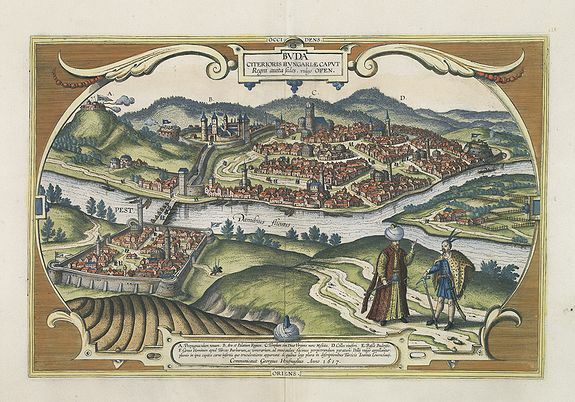 The city atlas by Frederick de Wit is extremely rare and was composed of 132 plans and views, mainly printed from the plates obtained from Janssonius. The date of publication is uncertain, but must be after 1694 when he bought the stock of copper plates from Janssonius. He also published in or after 1698 two editions of a town book of the Netherlands with 124 plans and views. Usually F. de Wit added his address "F.de Wit Excudit Amstelodami" and a scale border, when not originally added. This plate is printed from a Hogenberg / Janssonius plate but has no address added, and a blank verso. Condition : Repair of split lower half center fold, hardly notable. In good condition.